Pass Your Driving Test With Us! 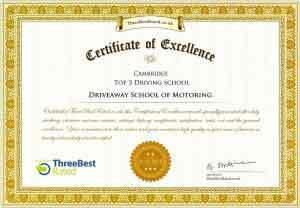 Driveaway School of Motoring; Our driving school, supports the quality & professionalism of driving instructors. Welcome to our driving school. You are on the verge of changing your life forever by getting your driving licence. The most important lessons are not at the end near the driving test, its right now! We will help you to create good driving habits. It is these habits which are going to help you become a natural driver making your test much easier. Driving lessons in Cambridge and the surrounding towns and villages are available with us. Please follow this contact us link and select the nearest driving instructor to the area where you live. Learning to drive should be a great, pleasurable and stress free experience. With the qualified expert driving instructors at Driveaway School of Motoring provide both theory test and practical driver training and show you all the correct procedures for driving in town traffic, rural roads and dual carriageways. We provide the latest learning techniques and vehicles. We will ensure that you receive fully professional and easy preparation for your driving test to get you on the road with confidence. For a great driving school, Cambridge and the surrounding towns and villages, click the following link to contact a Driving Instructor in your area. The following web pages contain information about obtaining your driving licence with our driving school. If you’re interested in our services and learning to drive with one of the Cambridge area’s leading and largest independent driving schools? Then please contact us – we look forward to hearing from you! Driveaway School of Motoring Limited is a Cooperative. The driving instructors that work with it are independent and are guided under DVSA Terms & Conditions. Our members are a friendly, professional team of local driving instructors and make Driveaway School of Motoring your first choice in driving schools. 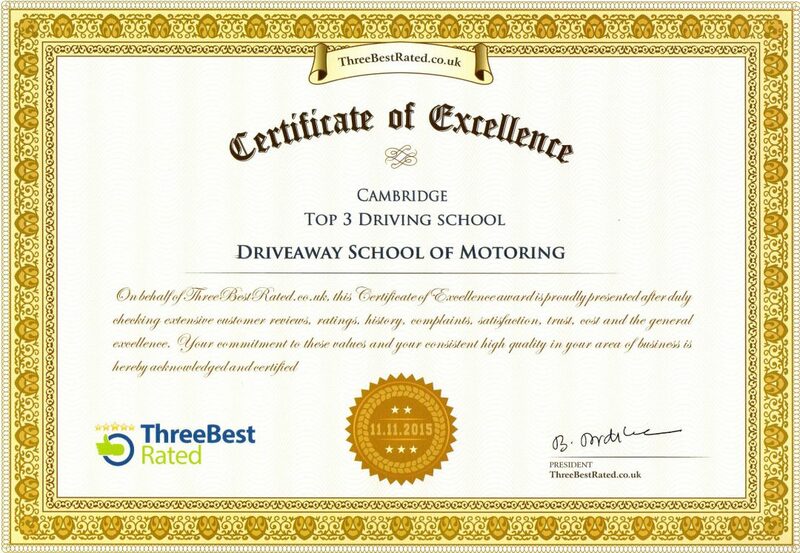 We are one of the largest and best regarded Driving Schools in East Anglia in general and Cambridge in particular. The company was formed as a cooperative because we wanted to create an environment that would support the quality and professionalism of its Driving Instructors and thus benefiting its clients. It seems to be working. So much so that other driving schools in the country have started to emulate our model. See our full range of Driving Lesson prices here. We do not provide the cheapest driving lessons as we are not ‘bargain bucket’ driving instructors. As with many walks of life you get what you pay for. Ask yourself why others would charge less? Driving Lessons and Driving Courses available in the Cambridge Area are Manual, Automatic, Disability, Refresher, Pass Plus, Motorway, Fleet Driver Training & Risk Assessments. Don’t just take our word for it take a look at our Reviews & Testimonials.